The strength, beauty, and durability of solid oak furniture has made it a firm favourite for centuries; this hardwood is known to have been widely used as early as the Middle Ages in flooring as well as furniture. Its popularity for all types of home furniture has not waned one bit over time. Historical uses of oak are a testament to the wood’s incredible strength and ruggedness. The high tannin content of oakwood makes it very resistant to attack by all manner of insect and fungal pests to which many woods are highly susceptible. Oak is also a very dense wood: strong and solid enough for all manner of construction, and not just of furnishings and fittings. Viking longships were often constructed from green oak, as were many European navy ships prior to the nineteenth century. And, of course, oak has been widely used in the construction of timber-framed housing in several European countries over the centuries, and thanks to the long-lasting strength of the wood, many of them are still standing. The qualities that made oak so ideal for ship-building and timber-framing make it just as perfect for furniture construction. Well-made, well-cared for oak furniture will last a lifetime and more, thanks in part to its high resistance to pest damage, and its superb grain and subtle natural colour looks wonderful in any setting. One of the most valuable qualities of oak, aside from its durability and beauty, is its versatility; oakwood looks smart and stylish in every room of the house, and, of course, it’s strong and solid enough to be suitable for even the largest furniture pieces. The hallway is typically where guests enter your home, and as such it’s your first opportunity to provide a warm welcome. It’s also a place where all sorts of random items tend to congregate: keys and wallets, purses and bags, coats and shoes. The potential for clutter is high, and that means your hallway furniture needs to do double-duty, in that it should be functional as well as attractive. 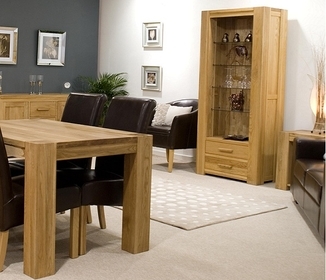 Oak furniture is the simple but effective solution, with clean lines that evoke an uncluttered feeling in a busy part of the house, and plenty of options for storage solutions that help make life more efficient. Adding one or two pieces of oak furniture to the living room is a great way up the style factor, especially if you’re just adding accent pieces rather than fully redecorating. There are so many pieces from which to choose, and the rugged construction and strength of oak furniture is perfect for rooms that get plenty of use. Choose from large statement pieces like sideboards, bookcases, storage chests and cabinets, and display cabinets, or go for smaller accents, such as a console table, side table, or a set of nested tables. Nested tables in particular are increasingly popular living room furniture additions, thanks to their stylish versatility, and space-saving practicality. A solidly-crafted set of oak dining table and chairs is a fantastic centre-piece for an elegant dining room, and the perfect look for any décor. Choose from massive slab table or the more compact modern styles, and chairs of solid oak, or with fabric or leather seats; oak dining room furniture looks great and is practical and hard-wearing. Add an extra touch of sophistication with an oak wine rack or sideboard, providing extra storage and display space, with a small footprint that will fit perfectly in a dining room of almost any size. Alternatively, consider an oak-framed wall mirror, the ideal way to add a touch of oak to a small room without taking up floor space. Interior decoration is all about balancing style, comfort, and practicality, and for many people, the bedroom is the one room of the house where luxury is allowed free reign. Adding one or more pieces of oak bedroom furniture to the décor is the perfect way to create a sense of simple luxury in what some may consider the most important room in the house. An oak-framed bed is the obvious choice for setting the theme of the room, whether stylish and sophisticated or farmhouse rustic, but there are many options from which to choose in terms of accent pieces. An imposing dresser or chest of drawers, bedside tables or cabinets, a simple chest at the foot of the bed, all add their own flavour to the room. Add an unusual touch with a dressing table, something rarely seen in bedrooms these days, along with a table-top mirror, or even a full-length floor or wall mirror. Oak has always been an incredibly popular hardwood, but these days many people who buy new pieces of oak furniture are concerned not only about buying attractive and durable pieces of furniture, but also about the source of the wood used to construct them. Deforestation is a problem that has serious potential consequences for individual ecosystems and the planet as a whole, and for this reason many people consider it a priority to choose furniture made from sustainable sources of wood. It takes time to build up sustainable sources of wood, especially for oak trees, which must grow for several decades before they are ready to be felled. Not all oak furniture is made from sustainable sources; but over time, high quality furniture made from sustainable oak is becoming much easier to find. In most cases, furniture made from sustainable oak is labelled as such, so that consumers can take this into account when making purchasing decisions.